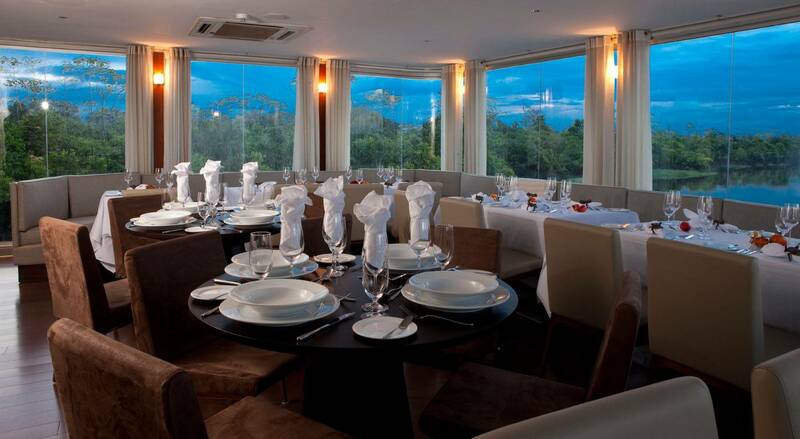 Spacious and indulgent, yet intimate enough to feel entirely exclusive. 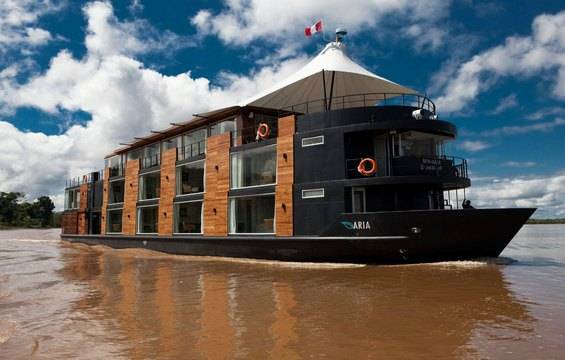 Custom built by leading Peruvian architect Jordi Puig, the Aria Amazon allows her guests to explore the Peruvian Amazon in utmost comfort. The 45 meter (147 foot) Aria Amazon set sail in 2011 following the success of its sister ship, the Aqua Amazon. 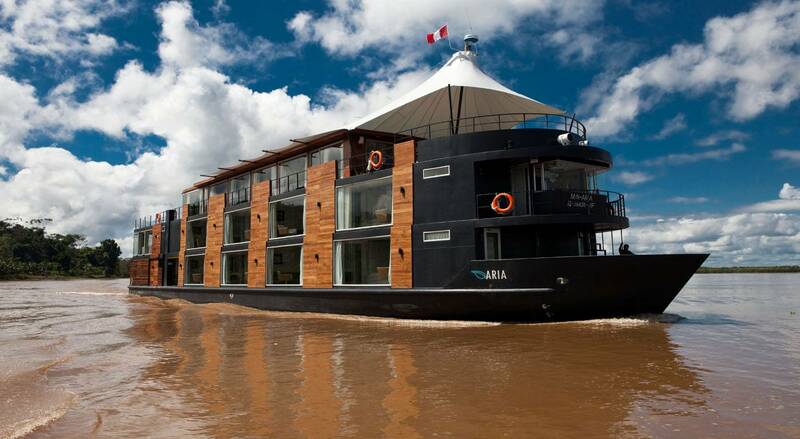 Spacious and indulgent, yet intimate enough to feel entirely exclusive, the 16-cabin Aria Amazon incorporates extremely generous dining and lounging areas including an outdoor Jacuzzi overlooking the Amazon’s riverviews. The striking matte black hulled ship can accommodate a maximum of 32 guests plus 24 crew including the paramedic and four English speaking naturalist guides. 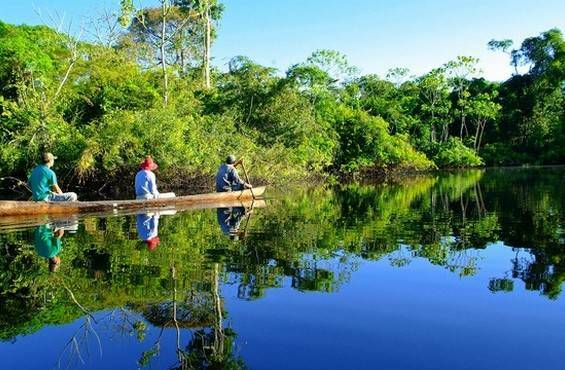 Aqua Expeditions highly experienced cruise ship captain and crew and the Aqua Expedition’s rigorous cruise ship standards ensure smooth travel and safety on the waters of the Amazon. 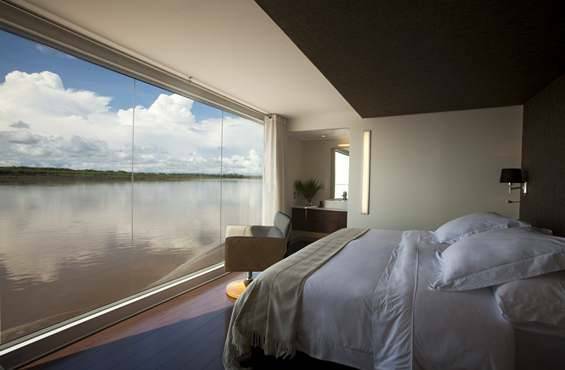 Floor to ceiling windows face the Amazon River (with blackout windows for maximum privacy) in each of the Aria Amazon’s 16 Design Suites, four of which can interconnect for families. Handsomely decorated with natural fibers and neutral hues these air-conditioned accommodations with en suite sitting areas and bathrooms each measure 23 square meters (250 square feet). 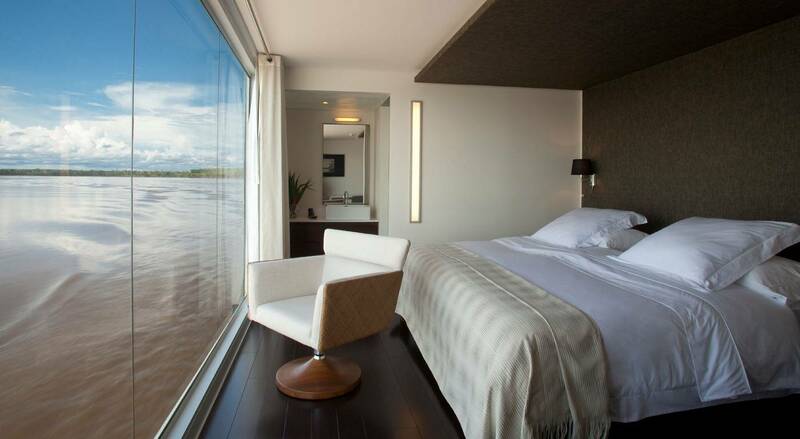 All 16 Design Suites on the Aria Amazon across the first and second deck measure 23 square meters (250 square feet), with individual air conditioning, polished timber flooring and a wall of floor to ceiling glass facing the Amazon River. En suite bathrooms with rain shower and organic bath amenities incorporate the latest eco-sensitive technology. Soft lighting, natural fibers and neutral hues create a relaxing and luxuriously comfortable enclave where one’s only challenge may be to decide whether to gaze upon the Amazon from atop the California king size bed (which can be separated into two twin beds) made with 100% Peruvian cotton high thread count sheets or while lounging on the cozy window-side day bed, binoculars in hand. Radio communication with separate battery pack satellite phone life jackets, fire extinguishers and smoke detectors in each cabin flares and signals; automatic defibrillator on board. Four auxiliary aluminum launch boats equipped with four-stroke low emission engines Constant radio communication with the main vessel. Each boat has a capacity of 8 passengers. 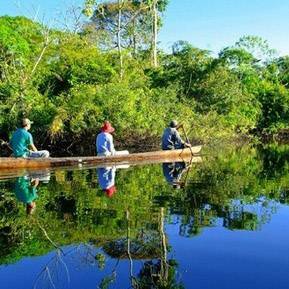 24, including a cruise director, paramedic and 4 English speaking naturalist guides. Contact us for full schedule.